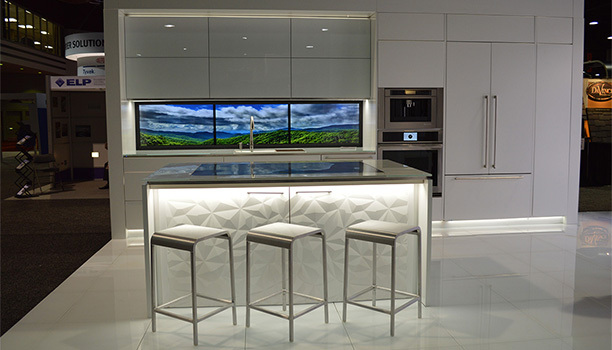 Ever wonder what the kitchen of the future will look like? 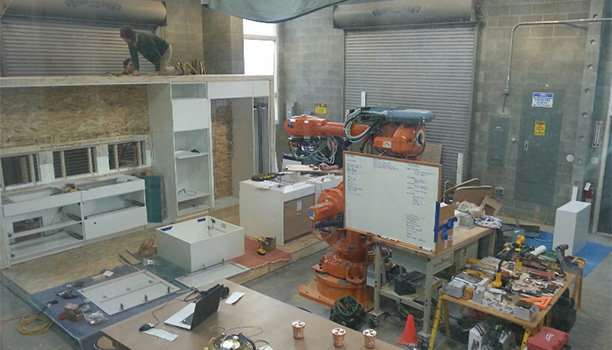 Plain & Fancy and a number of other manufacturers teamed up with Virginia Tech to build the FutureHAUS kitchen, a prototype of what your kitchen could look like in the not so distant future. Why not manufacture buildings the way we build cars, planes or ships? Virginia Tech's FutureHAUS research proposes an alternative construction — a prefabricated delivery method for medium and high-density urban housing. With efficient and accurate industrialized tools, CNC processes, and assembly line production, buildings can be made higher quality, less expensive and fully integrated with advanced electronics. Now, isn't that something to think about? Our friends at Häfele America Inc., who were already participating in the FutureHAUS, extended an invitation for us to be a part of the project. It is partnerships and programs like these that take us out of our constructed ways of thinking and open us up to forward-thinking ideas. What is the FutureHAUS kitchen? 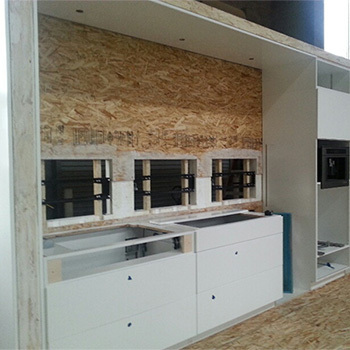 The FutureHAUS kitchen is a prototype that explores the possibilities of prefabricated architecture for the home. 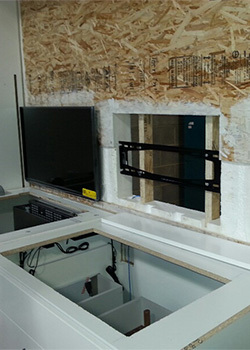 Kitchens, living rooms, bathrooms, audio visual walls, mechanical rooms, and even closets can be assembled as a "cartridge" and shipped prefinished, pre-plumbed and pre-wired to the modular frame assembly line. This process allows for a more sophisticated product that can be wired with integrated smart building technologies. The FutureHAUS kitchen can be controlled through a whole-house interface that manages and monitors appliance performance and energy use. The kitchen is wired with an array of technologies that make using the kitchen easier, more accessible and more energy efficient, elevating experiences and assisting with daily kitchen operations such as cooking, shopping and socializing. A camera that is placed inside the oven ensures your cookies won't get burnt, integrated sensors for the refrigerator can tell you when you are running low on a particular food item and a massive table built right in to the island allows you to send your recipes over to a number of monitors serving as an interactive backsplash. These are just a few of the integrated technology items in the FutureHAUS kitchen. For a detailed review of the FutureHAUS kitchen check out this link from smartHome.reviewed.com. 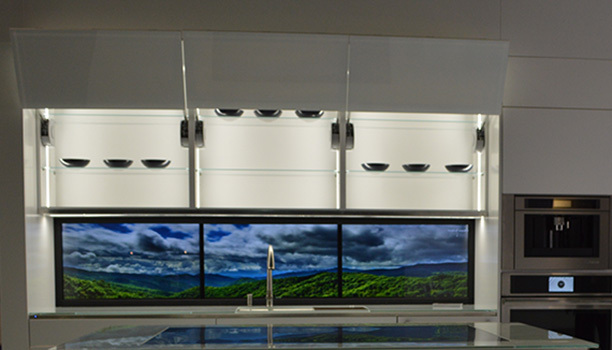 The goal of the FutureHAUS kitchen was that its ideology and function would take precedence over its style. To achieve this, Virginia Tech and Plain & Fancy decided on using full overlay contempo style cabinet doors with a white painted finish, frameless cabinet construction and melamine interiors. Stainless steel legra boxes and automated servo drive cabinets from Blum add polish and eliminate the need for hardware in the kitchen. Häfele America Inc. incorporates powered lift doors while aluminum frame doors with backpainted glass from Element Designs add sophistication to the space. Not only did we enjoy taking part in building the kitchen of the future, but our interaction with other manufacturers and the Virginia Tech staff and students has been exciting, informative and ultimately continues to further the discussion about how your future kitchen might look.